Is that an unflattering picture or what? I don’t think that top looks that bad in person. It’s Butterick 4986. I modeled it at a BABES event, and they all thought it was great. It’s too small under the bust, and it’s too long in the neckline. 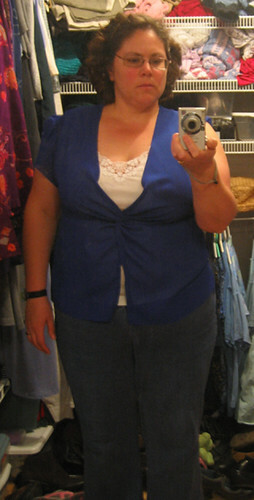 Georgene suggested that I turn the neckline into more of a sweetheart neckline by adding little gathers at the side. We’ll see. I’m not working on this right now. Instead, I have 3 t-shirts in the making. My tried and true (TNT) basic t-shirt is on ‘Tina waiting to be hemmed; it’s out of a lightweight white poly from Joann’s. My raspberry cheongsam is on the cutting table with the shoulders sewn together. I decided to put a facing on this one, where the fronts attach. I don’t like the little sew in snaps, so I’ll need support for whatever closure I decide on. I know, I know, I should have the closure picked out before starting, but I just don’t work like that. And my grey burda twist-top t-shirt is cut out and waiting for its turn to be sewn. 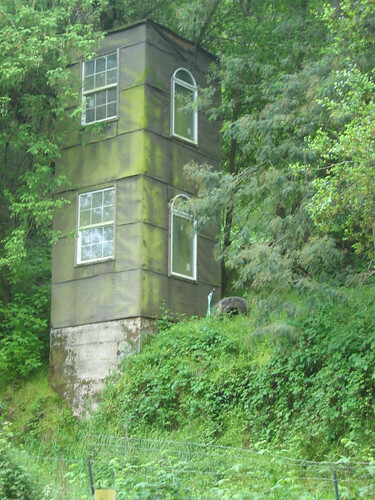 This odd looking building was up the hill from Bamboo Giant. I guess that it was a watertower, once upon a time. I met with my ED nurse yesterday. I wanted to talk about changing my food plan. The last time I tried doing this by myself, it was a total disaster. I tried to remove simple carbs from my diet, and within a week, I was binging on chocolate candybars at work. So I tried it, it didn’t work, and I moved on. But now, I was gun-shy, aka hesitant to change my food plan by myself. I am more hungry in the morning than the afternoon, and I’m not hungry at all at night. Well, a little around dinner, but not like the morning. I wanted to change my plan to have Breakfast (5 – 6 am), Lunch (9 am), Snack (noon), Snack (3-4 pm), and Dinner (6:30 pm). I’m not sure I’m going to do that. We think some of my issues may come from my choice of snacks. I really like to have a yogurt (8 oz) and an apple for snack. As part of getting over the ED, I decided to eat whatever yogurt my husband brought home from the store. Well, he brought home low fat yogurt with added sugar. I used to be fat-phobic, so that was what I would have freaked out about before. I probably wouldn’t have been thrilled with the sugar, empty calories. The ED nurse suspects that my early hunger issues may have to do with the sugar jolt from the yogurt. So I’m going to give it up, that brand, and tell DH to not bring home any more Cost Co yogurt. Instead, I’m going to get non-fat yogurt from Trader Joe’s (probably with live cultures) and pumpkinbutter (delish!) or jelly/jam/fruit spread stuff or if I have time and ability (excuse me, I’ll be back in 20 minutes to this very important meeting, but I have to cut up a melon for my snack) fruit. Now, to find time to go to Trader Joe’s. I brought cheese sticks instead of yogurt for today, but for Delemeter brought in fresh baked bread and butter, so I ate that instead. Simple carbs, oh, well. No wonder I’m hungry at 10:30. I’ll eat an apple. Can you say self-torture? I’m at work; I’m supposed to be working; I want to be working, but no, I’m obsessing about food and my eating disorder, what I’m supposed to be eating, what I’m not supposed to be eating, what eating the right/wrong thing does to me. I beat myself up for giving in to temtation and eating the bread. I didn’t follow my foodplan. I even brought string cheese for my snack. Did I eat it? No. Do I beat myself up? Hell, yes. Failure, Stupid, Weak keep whirling in my head. Oh, and it gets better! I could go to the bathroom and throw it all up. Great idea! And here’s the improvement: I identify those thoughts as distortions. I accept … no, I assert that I had control and that I made a conscious choice to eat the bread. I do NOT go to the bathroom to purge. I wish the thoughts would stop. I mean, I can stop them, but I wish they never appeared. I wish I didn’t feel guilty/bad/weak/etc when I eat a slice of bread. A slice of bread for God’s sake! So this isn’t really a thought record, but I’ll end with an affirmation. I ate the bread; I enjoyed it; it was good; I chose to eat it, and it is good for me to eat small amounts of things that do not meet the maximize nutrients/minimize calories criteria. A few more garden pictures. I’ve had this Japanese maple for almost 20 years. I bought when I was living in a townhouse in Pleasanton. My yard there had zero sun. The townhouse faced northeast. It was 2 stories high, and there were 2 large trees to the southeast. The townhouse was nice and cool. From there, we moved to a house in Livermore that had zero shade. 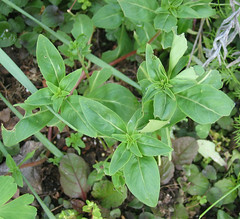 I had one plant that liked the sun, and all my other plants suffered mightily. After that, we moved to the house we’re in now. There used to be a large cedar tree in our front yard. Heck, it was the front yard. DH was always afraid it would fall on the house, but I thought it kept the house cooler in the summer and warmer in the winter. The tree was beautiful, but it dropped a layer of detris that was 2 inches thick every year. It was so much work to grow things under it. I was 6 months pregnant, it was hot, and it had taken me an hour to clean up a 10 foot by 1 foot area. That was it for that tree. 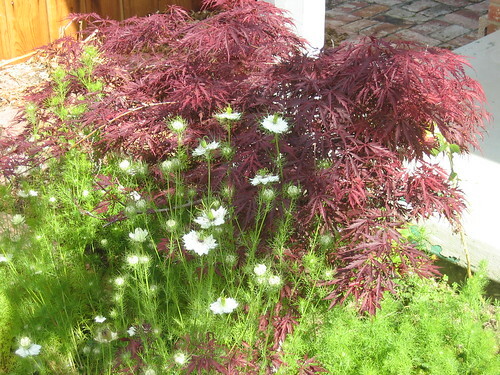 Fortunately, the Japanese maple was well established. It has done just fine in the blistering heat of summer. My mom gave me this shasta daisy. 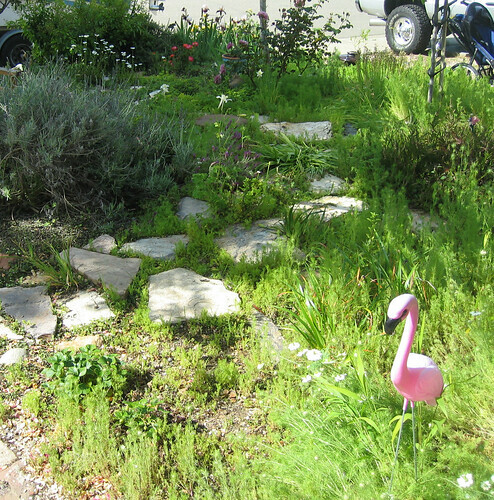 It was growing all over the place in her garden when they moved to Alameda. It’s done really well in my garden. 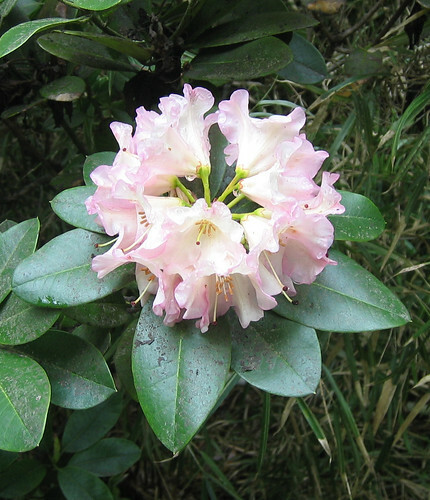 Some might consider it to be invasive, but you can easily control it. It doesn’t spread far. If you keep it deadheaded, it doesn’t spread at all. Pulguito can’t wait for the almonds. I’m not sure why. He doesn’t particularly like almonds. 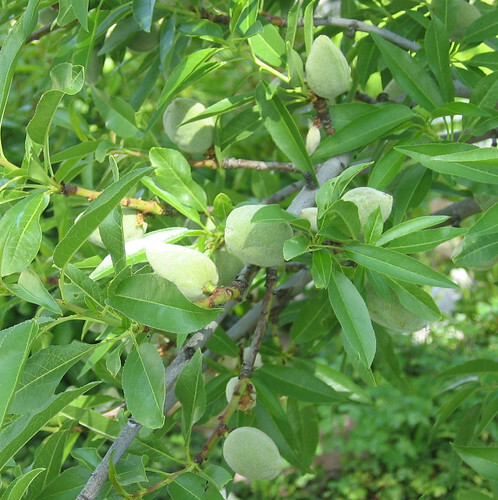 Perhaps it is because we have been eating the apricots, and they are good. There is nothing like fruit ripened on the tree. The flavor is crisp. And when the fruit is warm from the sun, it is a little piece of heaven. 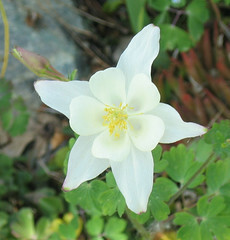 And I leave with an image of a columbine. Lovely, what? Saundra gave me the sea thrift some time ago. It hasn’t done so well in my garden. I suspect that it doesn’t get enough water, and, perhaps, the desiccating furnace blast (aka sunlight) is too much for it. I really like it. 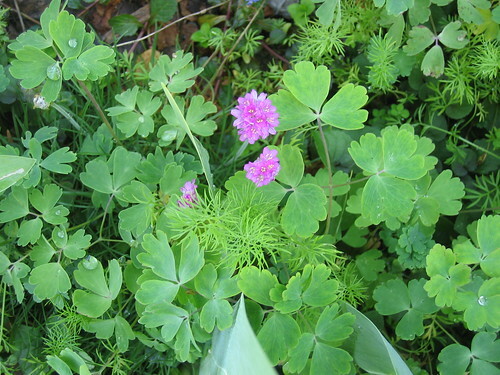 It’s a nice ground cover, and, of course, I like the pink flowers. It’s not much to look at, but this China Tea Rose smells heavenly. I did not pick the best place to plant it. The blooms ball when they get wet, and there’s a sprinkler head just below it. 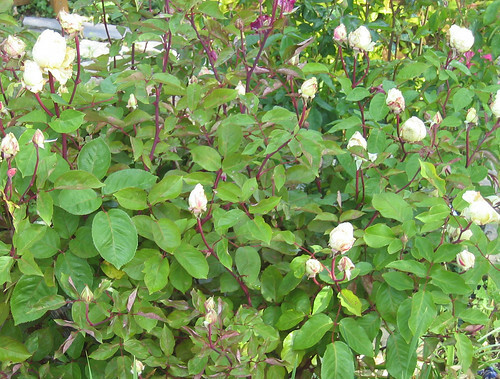 This rose has one excellent flush in May, and then it blooms repeatedly, but nothing like the first flush. It is disease and pest resistant, which is nice. And it seems to like the weather in Livermore. I think this is Clarkia rubincunda. Since I don’t have any flowers, it’s kinda hard to tell. It seems to be doing well. We shall see what happens. 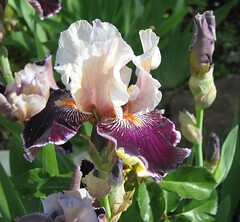 And one of my bearded iris. I bought a collection with Mary Clare, almost 15 years ago. They’ve done very well. They seem to like full sun. Here are those bearded iris with the old yellow rose that we moved from the backyard. The rose is struggling. It died-back last year, but it is still hanging in there. The roses are lovely. In the far background, the white flowers are love-in-a-mist. They make a beautiful field of blossoms every spring. You can also see Angel Face, the purple rose; that rose loves the Livermore climate. Moving counterclockwise, there is the last of the woodland hyacinths, more love-in-a-mist, and the beginnings of the cannas. 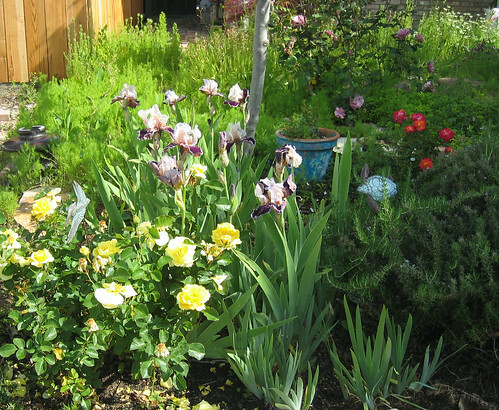 The bearded iris and old yellow rose are next to rosemary, which also loves the Livermore climate. I severely prune the rosemary at least once a year. And as we come full circle, we have a couple of miniature roses. The one in the pot is a moss rose, and I forget the name of the orangered mini rose. May is a really beautiful time in my garden. Everything explodes. Things are green, but the weeds haven’t grown very much. 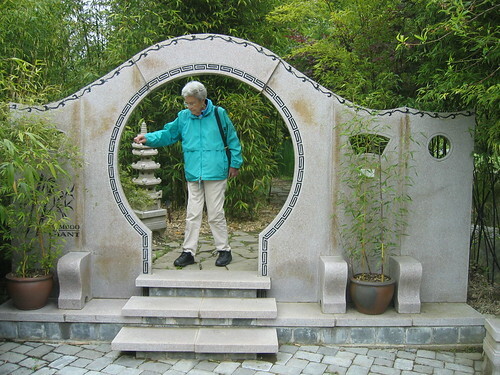 I asked my mom to buy me the moon gate, but she refused. 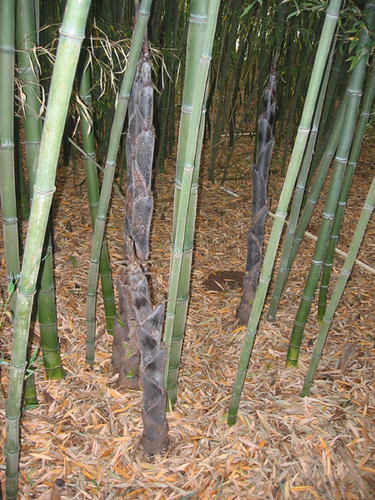 We speculated that Bamboo Giant used to be a general nursery. 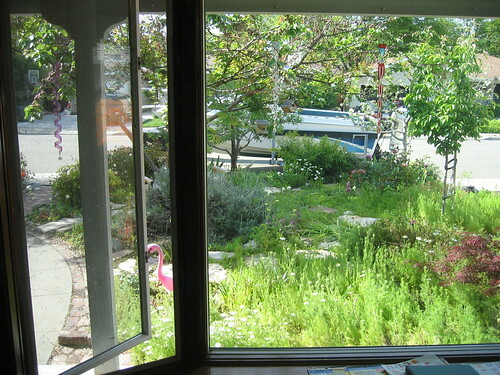 They had several nice shrubs, all very neglected, tucked in here and there among the bamboo. If you are ever down in Aptos, be sure to stop by this great nursery. It’s worth it to just take a little walk among the bamboo.